When I’m this far north I regularly check out a website that gives info about possible Aurora Borealis sightings. On May 23 when I was staying at Mammoth Hot Springs campground the possibility for seeing the aurora was good so I went out at about 10 pm. The ideal spot would be as high as I could get, but unfortunately the folks at MHS don’t see to understand about light pollution. The view from the parking on the Upper Terraces was compromised by the lights below so I found a better spot on a pullout just below there with trees to hide the lights. 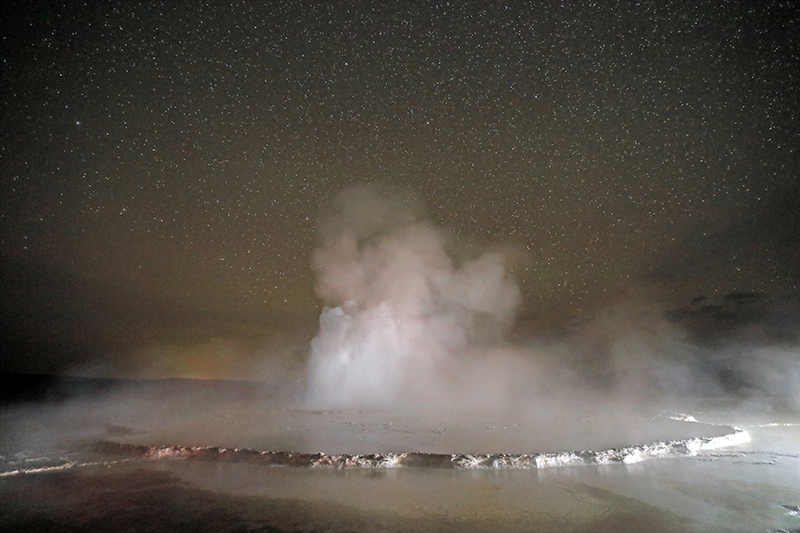 The yellow plume in the image is steam from one of the hot springs that is lit up by the lights. Once I was satisfied with that image I turned more to the east and was able to get a nice image of the Milky Way. Three days later I got a notice that the Aurora might again be visible. O10:15 pm on the 27th I left the Canyon Village campground and headed south to Hayden Valley. When I had parked and got out to check the view I could immediately see some lights high above, Bingo! Quickly got the camera and tripod out. Wow! Had to put the 14 mm lens on to capture the sight. The vertical spectre was amazing and moved slowly from north to northwest then faded out. 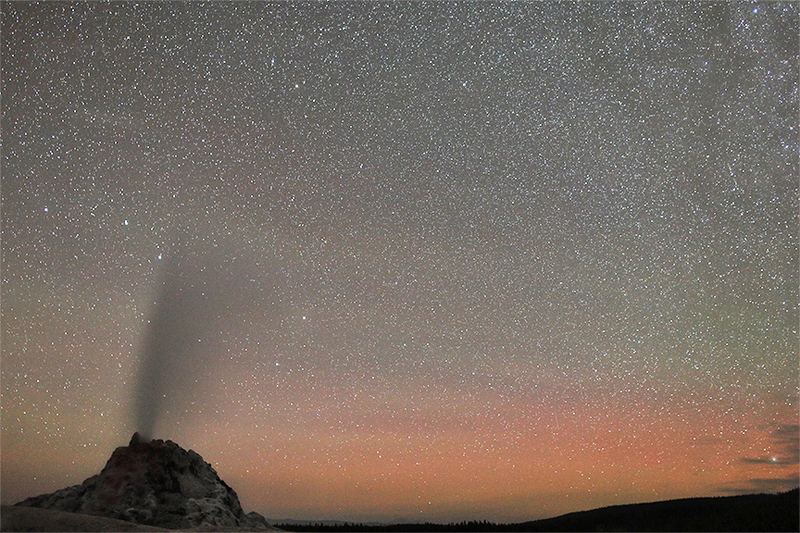 This phenomenon is called “Steve” in Aurora circles for lack of a better name. After that I concentrated on the Aurora down near the horizon and moved to different spots to get different views of it with the Yellowstone River in the foreground. In some of the images you can see a bit of the Milky Way, but the moon is waxing and it isn’t the best time for that. I went out the next night but didn’t see any lingering color. Once the moon was down low I did manage to capture the Milky Way, though not as good as it would be with no moon. I arrived at the Mammoth Hot Springs campground late Wed. afternoon. Since it was a clear night I decided to drive up to the Upper Terraces, above the hot springs to see if I could see the Aurora. Yes! The Milky Way was also visible. One of the things discussed with a good friend was how unique it would be to photograph the hot springs with the Milky Way above them. On Wed. night that opportunity was at hand. The ambient light did a fine job of lighting the hot springs, the steam clouds make them a bit blurred, but add to the effect. The Elk are in rut and often seen right in the campground. This bull and his harem were right near my trailer and I was able to get some wonderful images. Tuesday evening was my last night at Glacier and it was spectacular. I decided to go back to the visitors center that evening to learn more about the heavens, then I thought I’d drive to another location to try to get the Milky Way again. As the astronomers did their thing one of them mentioned it might be worth looking to the north with our cameras later in the evening. They knew that the Aurora Borealis was predicted for Wed. & Thursday evenings but it was looking like we might see them Tuesday. We sure did!! I took many images and have attached a couple that seem to capture it, though photos can really do it justice. Suffice it to say we were all close to doing “happy dances” as we stood there in amazement as it unfolded. It finally began to wind down after 1:30 am. What a wonderful way to end my visit to Glacier NP!